Stopped time in the frame of each. Black and white color is very dear to me. In each family in the depths of the bookcase are stored albums with old photographs. In the bustling daily rush, we seldom take the time to touch the burnt pages, to peer into these smiling faces of people who have left their mark on our lives and in our hearts. From naive black and white pictures, our grandparents, fathers and mothers are watching. We again feel quite small, hear their voices, remember smells and sounds, our first pranks and punishment for them, childhood friends and broken knees, waiting for a holiday and the joy of gifts received. We feel the very connection between times and generations that cannot be broken. Photos trustfully tell about the simple life of several generations of our family, joys and victories, significant events, family holidays and trips. We look at them and realize the passage of time, collect an invaluable mosaic of human destinies. And now, not just the life of a single family is unfolding in front of us, but a whole epoch, a huge country opens its arms. We see nation-wide construction projects and huge factories, ships plowing the seas, and airplanes that are not terrible for the bad weather. We see courage and heroism, we feel the power and strength. Sincerity and faith. Openness and honesty on the faces and in the eyes of people who simply gave themselves to their work and did not know how to live otherwise. 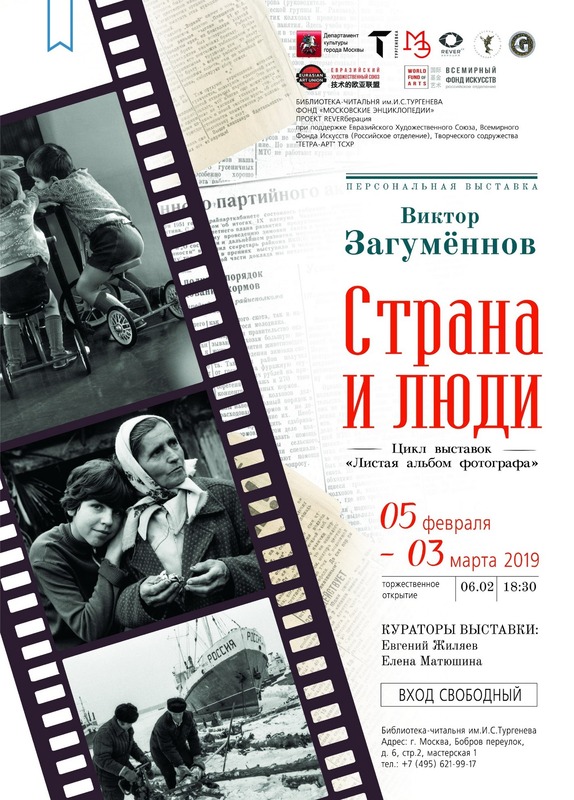 The exhibition “Country and People” (the cycle of exhibitions “Leafing through the photographer’s album”), created by a man taking photos from school, invites us on a small but very kind journey across the expanses of the USSR of 1970-1990. Life long journey. The photographer offers us not just frames, but plots full of details, which, given their deliberate simplicity, are full of deep psychologism and internal dynamics. Each picture makes you look at it for a long time, listening to the feelings and thoughts that slowly dissolve inside. The person who is in the focus of the camera master, shows his true feelings or character traits, whether it is fatigue, sadness, thoughtfulness or kindness, cunning and strength. Filled with lightness and air, reflecting forever frozen moments of history and carrying deep meaning of the photograph of Viktor Zagumyonnov, it seems to awaken the soul and stop real time, making you feel the beauty and values ​​of every moment of our life. Thirty-six frames, just as many can be on one film — the result of the author’s tremendous creative work — were taken from many thousands of frames taken during his work trips at different times in different regions of an immense country.